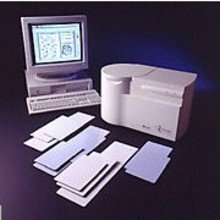 Meet application imaging requirements with versatile autoradiographic, photographic, and imaging equipment available at NETA Scientific. We supply a comprehensive range of top quality 1D imagers, phosporous imagers, autoradiographic equipment and accessories, image analyzers, lab cameras and accessories for biotech, pharmaceutical, chemical, food & flavors, and government research and development laboratories. Browse a complete line of autoradiographic, photographic imaging equipment for efficient scientific testing and analysis.